This is a great recipe for a feature appetizer at dinner, or as a great bring along for an oyster roast, tailgate or a holiday get together. 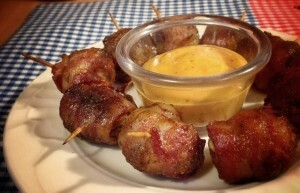 It’s a “twisted” version of the old standby sausage balls that used bulk or “chub” sausage and Bisquick. This version adds a flavor punch from stuffing mix and roasted chilies. Originally posted years ago as JB’s Sausage Balls, this process adds the chilies and a bacon wrap for an all around great dish. 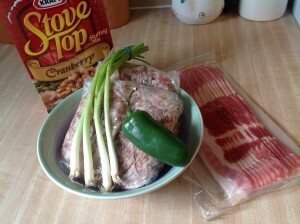 Assemble these simple ingredients: Stuffing mix, bulk sausage, celery, onion, green chilies, an egg and a pound of bacon. Kraft Foods has been introducing new flavors to the stuffing mix category. The Cranberry brings a nice tart flavor component to the table. Use any type of onion you like, just be sure to give it a fine dice. 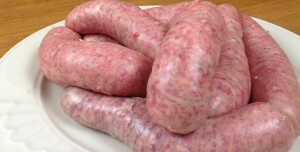 I grind my own sausage but any bulk or chub sausage is fine. Control the spicy heat of the dish through the sausage. If you like it hot, buy hot sausage! 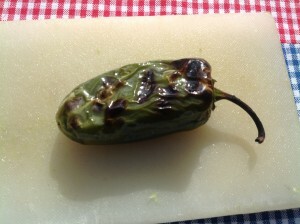 Start by coating your chiles with a little oil and roasting them on a clean grill over a hot fire. This can be done during your grill preheat time. Be sure to char the pepper on all sides. When the skin is well charred and looks like it separates from the meat of the chile remove it, and put it in a plastic sandwich bag. Place the bag in the refrigerator for about 15 minutes to cool. 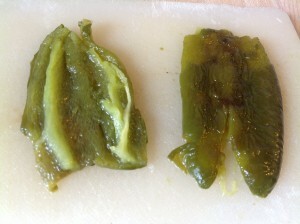 The trapped steam and the cooling process will loosen the skin of the chile, making it much easier to peel. Peel, de-seed and de-rib the chile. The heat of the chile lives in the seeds and ribs. If you like it spicy leave the seeds and ribs in. Lay the pepper on a board and give it an fine dice. While you’re at it dice the celery and onion too. 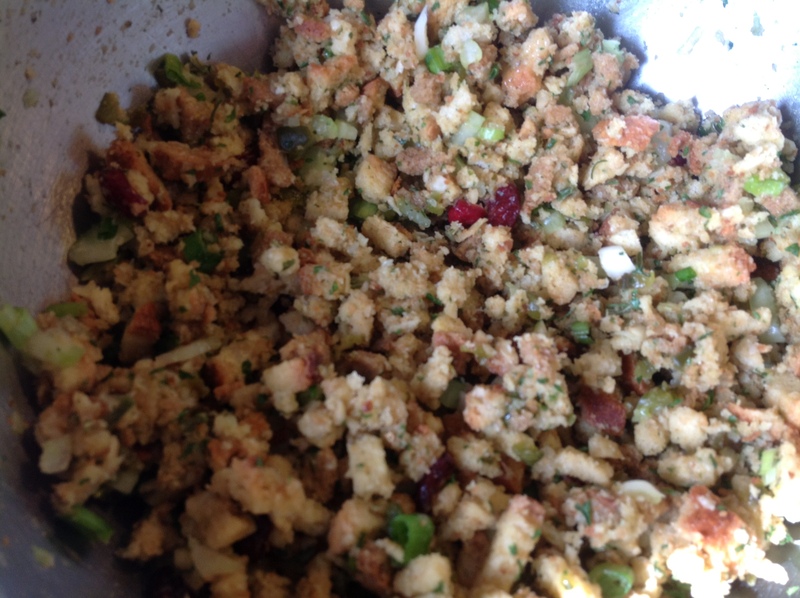 Rehydrate the stuffing mix in a bowl and add the celery, onion and chiles. Mix well. 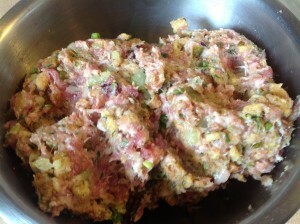 Add the egg, and sausage and continue to mix well. Use a melon ball sized scoop or take about a teaspoonful of the sausage mix and roll into balls. 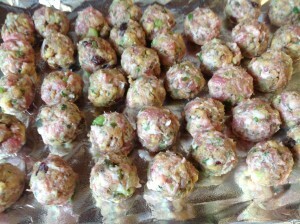 Place the balls onto a sheet pan lined with foil or parchment and sprayed with a little oil to keep them from sticking. Wrap each stuffing ball with bacon and secure with a toothpick. Get them ready to season. 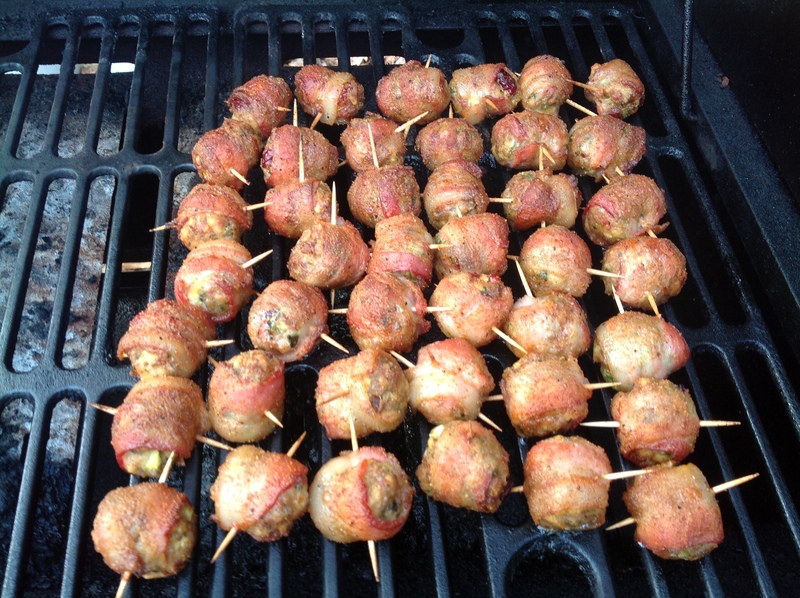 Season the Hog Balls well with your choice of seasoning. Salt and pepper is fine. These were seasoned with Jac’s Tailgaters BBQ rub. Preheat your grill to about 325 degrees-350 degrees. 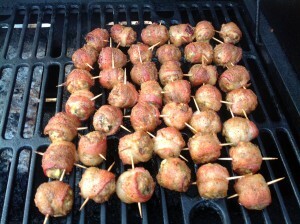 Place the Hog Balls on the cool side the pre-heated grill. If you are using charcoal, bank the coals to one side and put the “balls” on the cool side. 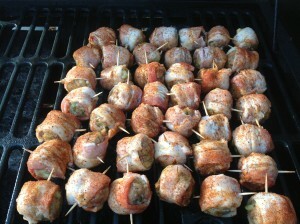 If you are using a gas fired grill with multiple burners, light one burner and place the “balls” over the unlit burner. Cook covered for about 30 – 40 minutes until the internal temperature of the Hog Balls reaches 165 degrees and the bacon is thoroughly cooked. Glaze with the sauce of your choice. 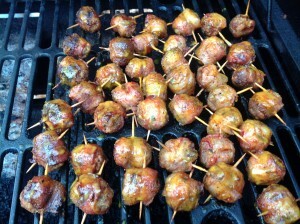 A simple Ham glaze, mustard based BBQ sauces work particularly good with this recipe. Let the glaze set for about 10 minutes. Mix stuffing and hot water in a bowl. Mix well. Add celery, onion and chile peppers, continue mixing. Add egg, and sauasge and mix until throughly combined. Use a melon ball size scoop to measur out equal amounts and roll into balls. 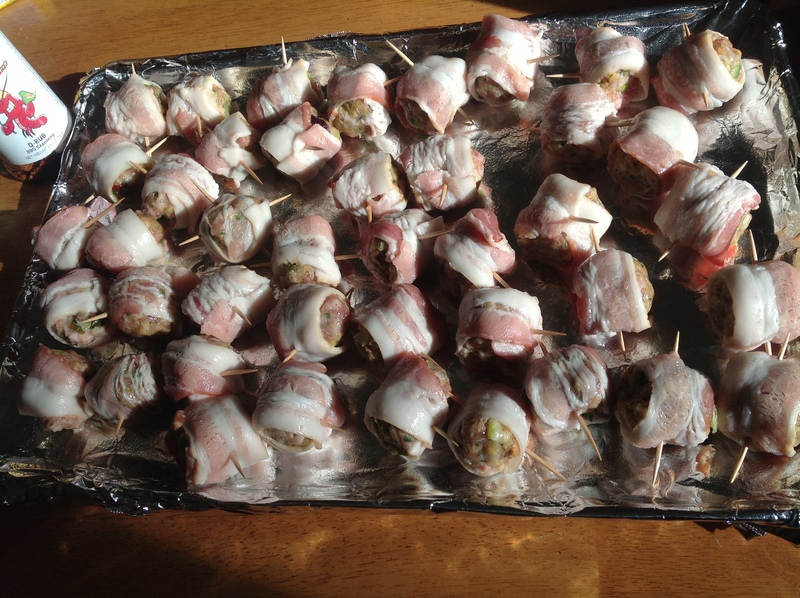 Wrap each ball with 1/3 slice of bacon. 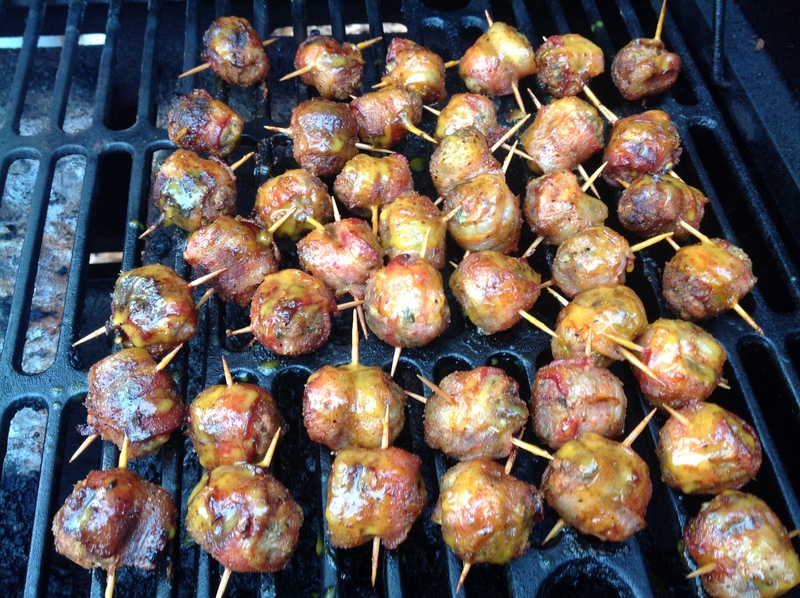 If you are using charcoal, bank the coals to one side of the grill and put Hog Balls on the cool side. If you are using a gas unit, light one burner and put the Hog Balls over the unlit burner. 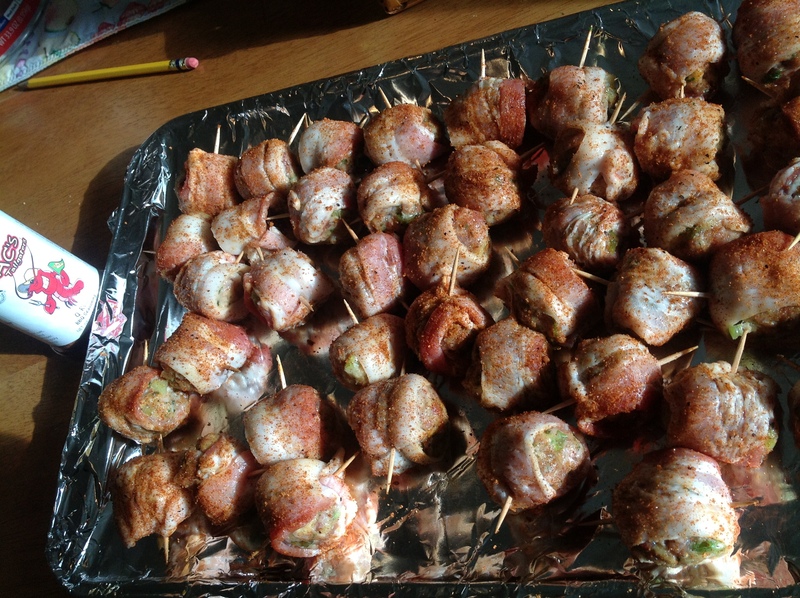 Cook covere, for 30 - 45 minutes until the internal temperature is 165 degrees and the bacon is throughly cooked. 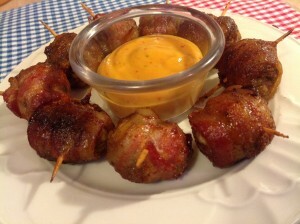 Remove Hog Balls from grill and plate with a dipping sauce. This recipe used a Southwestern Mustard.